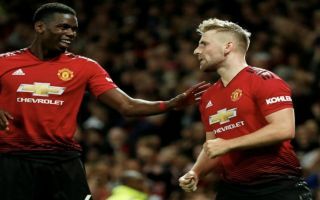 Manchester United left-back Luke Shaw took to Twitter to mock his United teammate Paul Pogba after United’s 3-1 win against Huddersfield. The appointment of Ole Gunnar Solskjaer as United’s caretaker boss looks to be a better decision every day, the Norwegian seems to be the perfect man to get United’s season back on track. Solskjaer’s appointment has worked wonders so far and it appears to have lifted a weight off the United players’ shoulders, there is no longer a risk of being publicly criticised by Jose Mourinho which has allowed the players to get on with their football and not worry about off-field dramas. The transformation in the side’s morale is evident with Shaw’s mockery of Pogba, the England international thought today was a great opportunity to get one over on Pogba. Pogba was heavily criticised for a social media post that was published directly after Jose Mourinho’s sacking as United boss, the Frenchman was forced to delete the posts off his social media accounts after his character and behaviour was called into question.